The area around the Superstitions is rife with ruins, ghost towns, abandoned mines, yipping coyotes, and legendary figures. Classic movies were filmed, canvas tent mining camps rose and fell, American Indians built and abandoned cliff side settlements, and stage coach stops still operate. 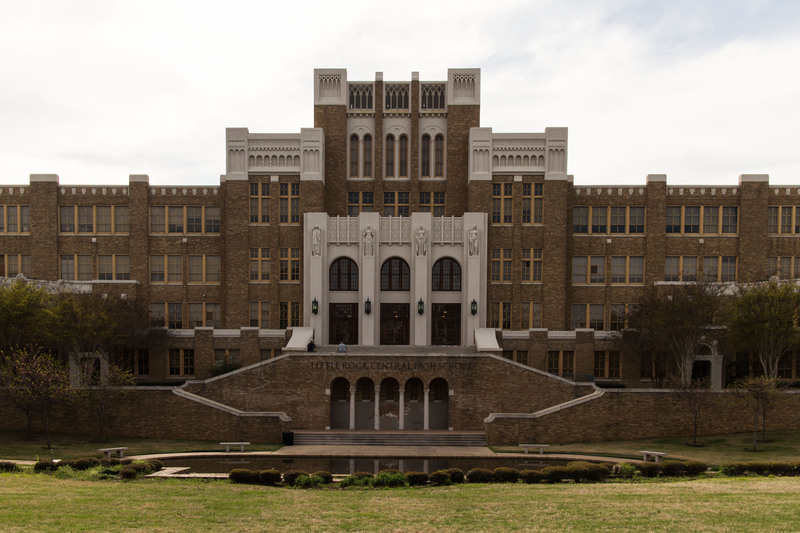 The history of this place is immense; in four days I feel like I only scratched the surface. There are many stories about how they got their name; most seem to revolve around the local American Indian tribes, who claimed that many strange things happened up beyond those stone faces. My favorite theory is that the wind blowing through the wild crags makes wailing sounds that put people in mind of spirits and monsters. Supposedly there’s an unbelievable vein of gold running through the Superstitions. Jacob Waltz claimed to have found it, but on his deathbed 115 years ago could only give a series of cryptic clues as to its location. 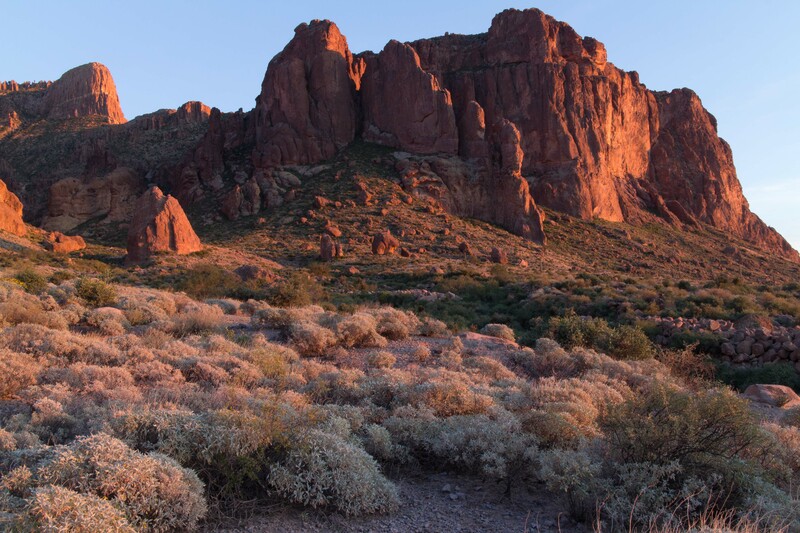 People have been trying to rediscover the Lost Dutchman Mine and its treasures ever since. Of course there’s no way to know how true the stories are, but it’s a part of the Southwestern lore nonetheless. Located just about 45 minutes east of Phoenix, the cliffs on the southwestern edge of the range rise suddenly out of the desert floor, jumping up hundreds of feet into spires and canyons that could inspire a million stories. Lost Dutchman State Park, just outside the suburb of Apache Junction, isn’t much on its own but makes a great jumping off point. The campground and picnic areas are very nice and many trails lead directly into the mountains. I hiked a little over a mile up Siphon Draw Trail into its namesake canyon that cuts into the center of the range, which offered great opportunities to shoot some mid-day infrared photos. Much as I would’ve preferred to hike in the cooler morning or evening hours, IR demands bright sunlight. The trail went a lot farther and connected to other ones criss-crossing the wilderness area but my goal was to get up into the canyon and once I did that I was content to go back. Besides, by then I was hungry. I shot some new infrared of the Superstition Mountains. The problem with IR is that it’s best shot in broad daylight, which means being out in the hottest, worst part of the day, with all the tourists who for some reason are always out in the hottest, worst part of the day. Highway 88, the historic Apache Trail, loops up along the reservoirs of the Salt River to Roosevelt, where it meets 188 and then 60, which comes back around to Apache Junction. On the way it passes many towns and historic sites as it weaves through the mountains. Altogether it covers about 125 miles and makes for a very nice day excursion through the desert. Between Tortilla Flat and Roosevelt (about 22 miles), Highway 88 is dirt, but it’s well maintained. Aside from some washboarding it was fine, with very few ruts or rocks. Only the very lowest vehicles would have a problem with it. The Superstition Mountain Museum consists of an indoor exhibit hall ($5) as well as several buildings outside, including the barn and chapel from the Apacheland movie set. The rest of the set burned down years ago, but those were saved and eventually moved to the grounds of the museum. Elvis Presley himself once sang gospel songs in the chapel during breaks in the filming of Charro!, the only movie of his in which he did not sing. Goldfield Ghost Town straddles the border between historic and downright silly. Rebuilt with antique lumber after the original town burned down, it now consists of gift shops, ice cream parlors, and semi-authentic tours. The historical society museum ($1) does a good job of presenting the area and people who made it what it was. The train and mine tours ($8 each) were interesting although not especially long or realistic and they gave some conflicting information. There was also a bordello tour ($3) that made a point of letting potential customers know it was “child friendly”. Tortilla Flats is a one-time stage coach stop that’s still in operation as a restaurant and gift shop out in the middle of nowhere. Highway 88 meets 188 at the Roosevelt Dam, the largest masonry dam in the world, made of blocks carved right out of the canyon, although the newer concrete facing covers the original stonework. Tortilla Flat, Arizona. Originally a stage coach stop. A canyon along the road. I found a tarantula & gave him an ice cube. What can I say? He looked thirsty. Theodore Roosevelt Dam, Roosevelt, Arizona. The highest masonry dam in the world. Built from 1903-1911, it is made from blocks carved right out of the canyon, stonework which has since been faced with concrete. Tonto National Monument ($3), overlooking Roosevelt Lake, is a small cliff-side settlement long abandoned by its original builders for reasons unknown to us today. The lower ruins are readily accessible, although a visit requires a 1/3 of a mile hike up a steep trail. The upper ruins can only be visited on occasional ranger-led tours (reservations required), visit the park service website for dates and information. Unlike other ruins I’ve been to, most of the rooms at Tonto are actually open for visitors to walk through. They’re so well protected that textures and fingerprints are still visible in the walls. They also contain surprisingly little graffiti, although unfortunately a few people have managed to get away with it over the years. The cliff side ruins of Tonto National Monument. Within the ruins of Tonto National Monument. I thought it was so interesting to still be able to see marks & textures made by the original builders of these 800 year old cliff dwellings. 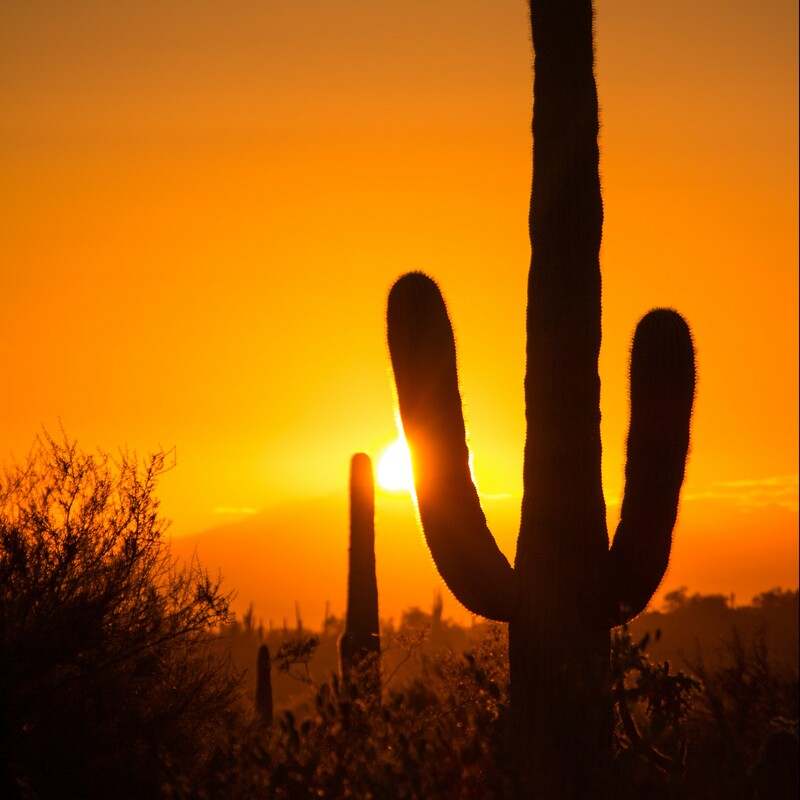 Fall asleep listening to coyotes howling, and try not have Stevie Wonder singing Superstition in your head the whole time. There aren’t very many towns that do a decent job of straddling the line between touristy & genuine, but Jerome, Arizona is one of them with lots of hippie artists & plenty of unique shops displaying their wares. They call themselves the biggest ghost town in the country; I’d call it the most heavily populated ghost town in the country, but whatever. Not sure exactly what they’ve got going on here, but my best guess is that each toilet belongs to a different group & they get whatever coins make it into their container. A burned-out hotel. The small structure on the left in a vault from the bank housed in the building. The requisite hilltop Grand Hotel that seems to exist in every old tourist town. 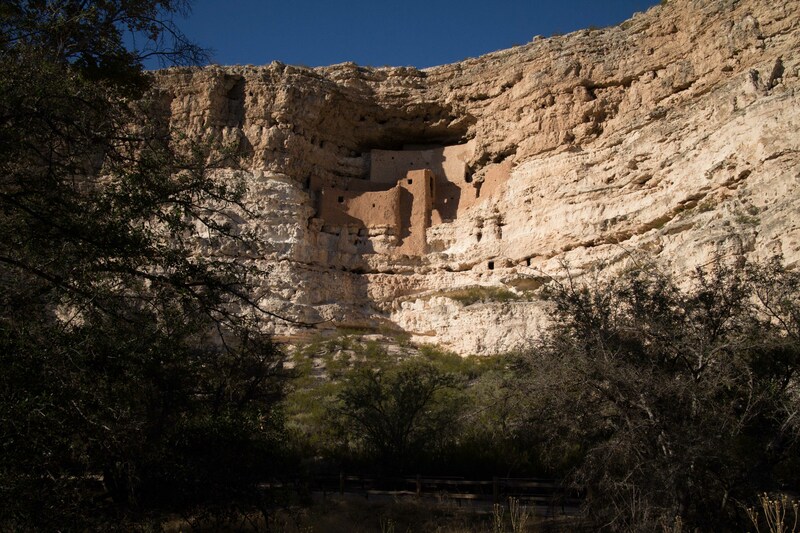 Not far away down the mountain in Camp Verde in Montezuma Castle, a set of Sinagua ruins built into a natural opening in the side of a cliff overlooking Beaver Creek. Unfortunately the ruins themselves are closed off to visitors and can only be viewed from below, but it’s a beautiful walk along the cliff base with some nice interpretive panels discussing the history of the area & the people who lived there.